UPDATED: Wed., Aug. 1, 2018, 9:55 p.m.
IRVINE, Calif. – Cooper Kupp covered plenty of ground during his first pro season with the Los Angeles Rams, finishing with 62 receptions for 869 yards and five touchdowns. His catch total ranked third among NFL rookies, the receiving yards ranked 24th among all players and he was targeted a team-high 95 times by Rams quarterback Jared Goff. Still, it may dwarf in comparison to the ground Kupp’s managed to cover this offseason – especially this past month – in his Southern California home. His routes often start in different places, but they almost always end in the same spot. Such is life for a first-time dad. There’s no playbook for this chapter of Kupp’s life, so the ex-EWU wideout finds himself deferring to something that’s been equally pivotal to his career on the football field. One month with our angel. Mommy and daddy love you, June. It shouldn’t be a surprise the most sure-handed wide receiver in FCS history has discovered a knack for changing diapers. He’s still not big on doing the laundry, “and now we have tons of laundry,” Kupp said, but on the bright side, he’ll have some reprieve from the everyday chores while the Rams undergo training camp in Irvine. A lifetime of playing – and thriving – on the big stage couldn’t have prepared Kupp for the birth of his first child. His wife was awake for 40 consecutive hours – “an absolute trooper,” Kupp said of Anna, a former EWU heptathlete. Unlike on the gridiron, where Kupp is always doing something for the betterment of the team, he said he felt “completely helpless” during the childbirth process. “Trying to do everything you can, but feeling like you can’t really do much,” he said. “But watching her go through that, I just can’t explain. Watching the miracle that that is. I obviously have a newfound respect for my wife and what she went through, so it was just an incredible experience. 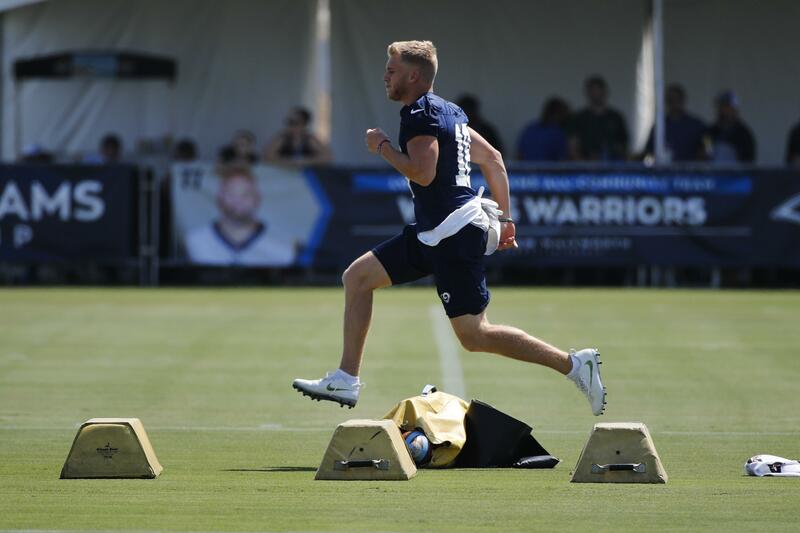 Kupp’s son was just 23 days old when the Rams receiver reported to training camp last Thursday, but he points out he’ll be twice as old the next time they’re together. “Kind of a weird deal thinking about that,” he said. The youngest Kupp joins a family with strong football roots. Cooper’s grandfather Jake and father Craig both had stints in the NFL. The second-year Rams wideout could be on the verge of his first Pro Bowl with another strong year. His younger brother Ketner, a college senior, is EWU’s projected starter at strong-side linebacker this fall. But the rich football lineage doesn’t mean Cooper will necessarily push his son in the same direction. The numbers Kupp posted in 2017 indicate a glowing season for any NFL rookie – and they weren’t just empty stats. The Rams clinched the NFC West title with two weeks left in the regular season and finished the year with an 11-5 record. Kupp caught the winning TD against Tennessee in the game that guaranteed the organization’s first division title in 14 years. More is expected of the Rams in 2018, mainly because of the heights they reached last season and the additions they made this offseason. A few of Kupp’s new teammates in L.A. include receiver Brandin Cooks, defensive tackle Ndamukong Suh and cornerbacks Marcus Peters and Aqib Talib. Visits to Cheney are few and far between for Kupp these days, although EWU fans may want to keep their eyes peeled for him on Nov. 24, when the Rams are on a bye week. If the Eagles qualify for the FCS playoffs and do so without locking in a first-round bye, they’d play on that date. Published: Aug. 1, 2018, 5:52 p.m. Updated: Aug. 1, 2018, 9:55 p.m.